Tesco has signed up as the first European brand to use Google's Connected Classrooms platform, a partnership that will enable schoolchildren to go on interactive virtual field trips without having to leave the classroom. The partnership – devised and implemented by Tesco’s digital agency Zone – kicks off today with a "field trip" to Naples to visit a pasta producer. Pupils will be able to take part in a 30-minute lesson and Q&A session with pasta producer Giuseppe Di Martino, who supplies Tesco. They will also be able to interact with classes in other schools during the trip. Other trips will include visits to rice paddies in India, a cheese producer in the Yorkshire Dales and a strawberry farm in Kent. The supermarket has worked closely with teachers to ensure its Online Field Trips are in line with the national curriculum. The "field trips" are powered by Google+ technology, while the Connected Classrooms concept was pioneered in the US, where children were able to talk to Nasa astronauts. The news coincides with rival Sainsbury’s partnering with Google to help families save money and avoid food waste with a mobile tool called Sainsbury’s Food Rescue. The Food Rescue tool allows people to speak into their device to discover practical help and inspiration on using ingredients they might otherwise throw away. The Tesco initiative forms part of its 'Eat Happy' campaign, with details available on a campaign hub created by Zone. Chris Bush, Tesco’s UK managing director, said: "We know from talking to teachers that cost can be a real barrier to taking their pupils on field trips. We want to help by offering all UK primary schools the chance for pupils to make virtual visits to places they wouldn’t normally be able to go and learn more about the food they eat. 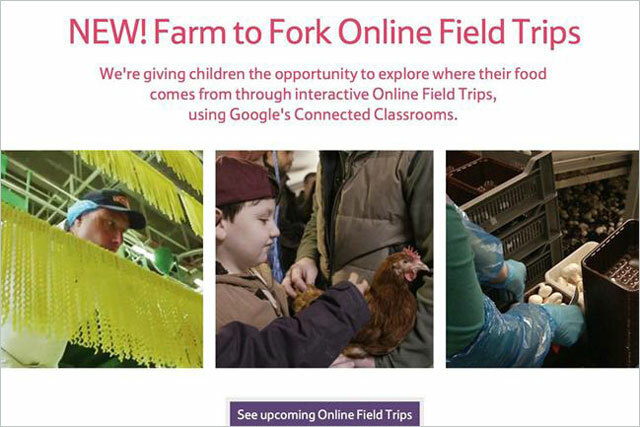 "We think these Online Field Trips will complement traditional school trips, such as our Farm to Fork Trails – 120,000 children have so far visited farms, factories and Tesco stores. "The new online trips mean even more children will get a better understanding of where their food comes from." Yesterday, Tesco chief executive Philip Clarke argued that the supermarket "is more competitive than we have ever been" despite recording its third consecutive quarter of falling sales. The retailer has just launched a new campaign (below) promoting its Price Promise across own-label and branded products.